The very first thing you should do if you recognize the signs of anxiety, is book an appointment with your doctor. Whilst a lot of self-help tips will help you to reduce the symptoms somewhat, in some cases medication may be needed. Anxiety can vary dramatically in severity. Some parents may experience very mild symptoms, while others may struggle to function because of it. You’ll need to be honest with your doctor about how serious your anxiety is and they’ll be able to prescribe the necessary treatment if required. A lot of parents are understandably worried about going onto medication. You can discuss your concerns with the doctor, but remember that there’s no shame in being prescribed with anxiety medication. It can really help you to manage the symptoms and get back to simply enjoying being a parent. You may not even need medication. There’s a lot of help available for anxiety disorders these days and your doctor will be able to refer you to local help groups. Just like negative thoughts, anxious ones can multiply pretty quickly. So, when you find your anxiety levels are starting to rise, the distraction technique can work wonders. It will stop those anxious thoughts in their tracks, allowing you to get a hold on the situation before it spirals out of control. There’s lots of ways you can distract yourself. Bring out your creative side and draw, paint or write a story. Read a book or listen to a little music. You could even use your child’s toys such as LEGO or Play Doh and bring out your inner child. By distracting yourself from your anxious thoughts, you’ll prevent them from becoming overwhelming. Do you struggle to say no to people? If so, this isn’t going to help your anxiety. When you’re constantly saying yes, it leaves you with very little time to yourself. You’ll find yourself agreeing to things you really don’t want, or don’t have the time to do. The trouble is, taking on so much extra work and responsibilities will leave you feeling overwhelmed and extra-anxious because you can’t possibly do everything that’s expected of you. Learning to say no can therefore significantly reduce anxiety and potentially save your sanity too! One of the most helpful ways to deal with anxiety is to connect with others. When you’re struggling to function because of anxiety, it can make you feel really alone. However, thousands of parents struggle with the same issue, and it can be really comforting to share experiences and tips on how to cope. The internet has made it possible to connect with parents across the globe. We actually have our own online forum that you can sign up to and find comfort in! If you’d prefer to actually talk to other anxious parents in person, there’s also local support groups you can join. Suffering in silence can make anxiety a lot worse, as well as lead to problems with depression. So, if you haven’t reached out to others yet, now’s definitely the time to do so. Did you know certain foods and substances can increase the symptoms of anxiety? Studies have revealed that certain foods can cause you to become calmer, while some can really rev up anxiety symptoms. Looking to calm your anxiety? Tryptophan rich foods such as turkey, have been shown to help the brain feel calmer. The amino acid encourages the brain to create more feel-good chemicals. Similarly, eating foods rich in B vitamins, whole wheat and omega-3 fatty acids are all going to help you feel less anxious. So, what about the foods that can contribute towards anxiety? Well, it’s advised to stay away from caffeine, processed foods, alcohol and even apple juice. While changes in your diet may not make your anxiety disappear completely, it can be helpful to at least reduce them. Exercise is regularly recommended to help combat depression, but it’s great for anxiety too. Now, the best thing about this tip is you don’t have to stick to an intense 45-minute workout to feel the effects (though obviously, the more you can do, the better). Studies have suggested that even a 10-minute walk can produce the same stress and anxiety-busting benefits as a 45-minute workout. There’s also been studies which have shown those who are physically active, do generally have less anxiety and depression than those who aren’t. So, if you start to feel anxious, a quick walk could be all you need to feel better. Some parents find keeping a journal is really useful for easing their anxiety. It’s a fantastic way to get all of your thoughts and fears out of your head and onto the paper. If you bottle up your feelings, they’ll simply build-up and start to become overwhelming. So, writing them down can erase the power they have over you, helping you to feel much more relaxed. Keeping a journal can also be a great way of identifying any triggers to your anxiety. By identifying your triggers, you’ll be able to either start avoiding them, or figure out a way to overcome the problem. Start writing down when you feel anxious and what you were doing prior to that. One of the main things recommended to those suffering from anxiety and depression these days, is mindfulness. It can be very useful in some cases of anxiety, though for severe anxiety it may be difficult to practice. It basically focuses the mind on the present. Anxiety comes from worrying about the future and what may happen. If you can bring your mind into the present therefore, you’ll feel a lot less anxious. Mindfulness can include a wide range of activities, with many finding mindfulness adult coloring books particularly useful. Similarly, you can also get the same effects from meditation and other relaxation techniques. The goal of all of these practices is to focus the mind and let go of any negative thoughts. If your anxiety is related to your child, you can start dealing with it by taking reasonable actions. A good example of this, would be if you worry your child may have a medical issue. Rather than sitting there worrying, or worse, Googling the issue, book an appointment with the doctor for an assessment. This helps you to take steps to resolve your fear and not let it prompt you into taking unreasonable action. Anxiety comes from not feeling in control. So, whenever you are anxious about something, brainstorm all of the things you could rationally do to ease the problem. This puts you into control and takes away the power anxiety has. For the final tip, above all else it’s important to go easy on yourself. There’s a lot of reasons you might be suffering from anxiety, and feeling like you’re not good enough is one of them. If you leave little time for yourself, it’s going to leave you feeling very stressed. This in turn will add to your anxiety levels. So, take a breath and more importantly, take a night off! You need some time to yourself to recharge your batteries. Don’t be afraid to ask for help and spend some time doing the things you love. Your anxiety isn’t going to get better if you keep beating yourself up over it. Overall, anxiety is a very common condition these days and it’s much more recognized than it used to be. This means, there’s a lot more help available. Going to see your doctor should be your first port of call as they will be able to assess the situation and determine whether you could benefit from medication, or more natural anxiety-reducing treatments. Anxiety is the feeling of worry, nervous, and unease. Post partum may suffer from this. With the help of your family you can or they can evaluate your sudden behavior changes. If you think that you’ve been like that lately then maybe you can try to have a break or pamper yourself. There’s alot of possible factors that may cause anxiety. For first time mother’s who are not yet that confident to take care of their babies maybe can ask help to their parents or other practitioner on how to handle and take care babies. Financial issues could be possible issues as well, in case that there are unexpected scenarios that really need to spend money. Parenthood is not that easy, everything should be prepared before planning to have a baby. In this way the less tendency that we could encounter problems like this. Readiness will give you peace of mind. True, problems with finances can cause anxiety and depression. Add to this problems with in-laws or relatives who act like they know it all and insist with their parenting styles. This can make a new mother think she is ill-equipped or even stupid. I guess it is always best to ask one’s mom instead, and not listen to all the negative comments about how one is raising her baby. Otherwise, it can only drive you nuts! New moms should read blog articles like this one so they’ll be better equipped. There are tons of helpful advice online so if a new mom gets the time, she should check the internet. I have practiced some of the methods you mentioned. I have been learning to say no to people because I have realised that I can’t please everyone. I have also tried to be easy on myself. Dressing well and reminding myself that I am perfect the way I am. Good to know you’re already applying/using some of the tips mentioned here. Good for you. Keep it up! It can truly save your sanity. I do believe connecting with other people online, especially moms like us, is very helpful because we get to share what’s on our mind without getting judged or becoming the talk of the town. Not many people who you think are your friends can be trusted these days, haha. 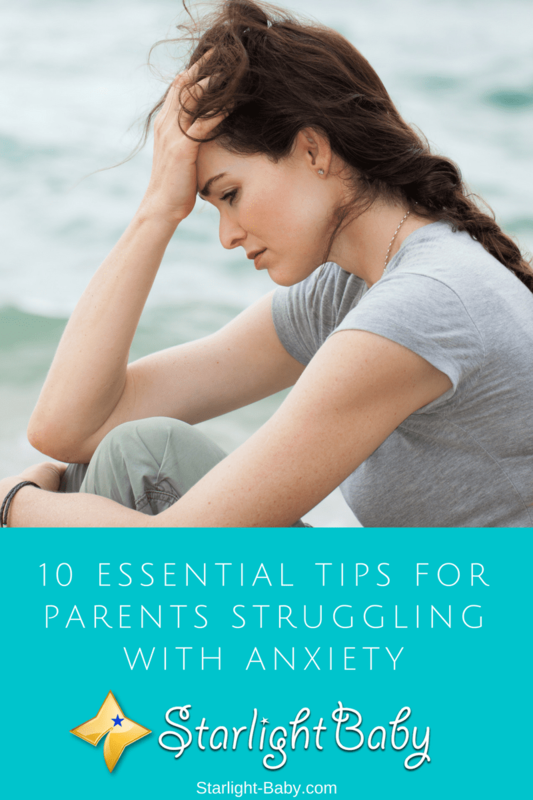 I believe there are many parents who struggle with anxiety, but that possibly don’t want to admit to not only the loved ones in their surroundings, but also to themselves. It’s difficult to adjust to life after having a child, especially if it’s your first, and this adjustment could be made much harder if anxiety was already a problem before the new baby arrived. The tips that were introduced in this article are probably the most helpful information that someone with anxiety could receive – especially about going to the doctor. Many people wish to fight things like anxiety and depression alone when, in reality, their lives would be made much easier if they simply attended a doctor’s appointment and got the help/medicine they need. Factors such and diet and exercise are especially important. I personally find that when I am eating a large amount of sweet foods and not exercising, my heart rate becomes higher and I feel so much more restless – it seems to increase my anxiety as well. I hope any parents out there who are suffering with anxiety will use these tips to hopefully feel a little better. Just remember you’re not alone. You are so right, hanseung, a lot of moms out there are struggling with anxiety and refuse to admit it or do not want to talk about it. As to why, there could be many reasons. And you know, keeping it to one’s self is really difficult – all the pent-up emotions will not do any good. I would say, if they don’t feel like talking about it with a medical practitioner (in case someone sees them and thinks they’re going crazy or what), they should find online support groups with whom they can talk to anonymously. Talking about the things that are making us anxious would help relieve some of it. Using distraction technique such as reading and exercise more would definitely help you in coping up anxiety more easy. Staying positive by staying with postive and happy people would be an advantage as well. There’s no rush in overcoming axiety, the more you think about it the stressful you are. So take time and don’t forget to get easy on yourself. It’s true, being positive or having a positive outlook can make a lot of difference. Having a supportive and understanding partner will also hugely help because oftentimes when we become moms, we lose our social life. I would say it’s the first thing to go, but I’ve come to realize it’s wrong. Moms need to have friends they can turn to when things get a little too much. They should stay in touch with their social circle. Isolation is not good. Actually these tips are helpful for everyone not just for moms struggling with anxiety, My friends who are stressed financially, with their partners and their kids are often experienced having anxiety, We have our ladies bonding or sometimes scheduled vacation every once or twice a month. It helps them breath, relax and think without any pressure. It helps them live possitively! That sounds like a very nice way to de-stress and relax. Keep it up! It will do you and your friends good. This is why I often say even if we devote our time and attention to our kids and family, we should never ever neglect our ties with our close friends because having someone to talk to helps a lot to unload the burden. Talking about our problems and having someone who listens helps a lot. It doesn’t matter if they are not able to give us advice; if they’re able to listen to our problems, become our shock absorber, that is enough. Take this advice seriously, people. If you think you might have an anxiety disorder, see a doctor right away! I was a downright monster before I finally conceded to getting my anxiety treated. You’re right, ecole11j. In order to cure anxiety, the person feeling it must first acknowledge she is affected, otherwise, she will just dismiss it as plain sadness. This could make it even worse. Accept the truth, don’t deny it, so you can begin to heal. Anxiety is a really serious illness and almost everyone is suffering from it. That’s why every one need to read this article to help them fight their anxiety too. Every one should remember that every things gonna be alright. Don’t be afraid, Don’t over think, Just enjoy every moment and every second that we are living in this world. Life is so short. Smile dude. You’re right, life is short, so we must do our best to raise our children well before we leave them behind when we die. We will not be able to fully fulfill this responsibility if we are unwell. Anxiety needs to be addressed so we can function normally and raise our children the best we can. I have to say at this point that it’s not always easy being a parent a d things might get quite tough to the stage we start to worry even of the slightest things that shouldn’t worry us. At that point is where I feel that anxiety has set-in and I’m glad to read that your first tip on tackling that is to visit the doctor for with some prescribed medicine, things can get back to normal. Yes, you’re right. It’s tough to be a parent, and this is aggravated by worries of what the future holds for our children. If we keep worrying, we become really anxious until it becomes a health problem. With proper medical attention, anxiety should cease to exist. My wife has a history of general anxiety disorder. I was worried about her when she entered the delivery room. Thankfully, after the child was born she never showed anxiety symptoms. Until now she is fine. It’s good to hear she got over her anxiety disorder. It’s difficult to live a life with this problem – it’s not good for her and for the family in general. To be anxious is normal because we all worry about our children’s future, but if it becomes a problem, one should seek help. Great to hear you were able to overcome it! I totally understand where you’re coming from. Most women become “isolated” once they get married and have kids. I guess social life is the first thing that women sacrifice to have a family. But this should not be the case. I’ve been “isolated” before and it’s not good for one’s psychological health. I wish avoiding stress and anxiety was as easy as the doctor’s make it sound,”You need to avoid stressors.” Umm, yeah, ok. Lol Beung a parent means dealing with stress (to a certain degree) everyday. It’s learning how to deal with that stress, like with the tips you gave above, so that you can avoid anxiety attacks and nervous breakdowns. With implementation of breathing techniques, daily exercise, meditation and all of the things you suggest, we all should be on the right path! Saying no has always been hard for me, as I imagine it is is for many parents. Not only can it be hard for us to tell our kids NO, it can be difficult relaying that same message to our own parents and siblings and yes- IN LAWSSS! Yes, it’s easier said than done. I agree, it’s not easy. It takes a lot of willpower to implement some of the tips here. But it would work wonders once we do. I particularly found it hard to get a regular exercise. It’s only recently that I am able to do it – a walking exercise on a daily basis. And yes, there are indeed a lot of stressors and in-laws are definitely on the list, sometimes they’re even on top. It is not easy being a parent, I watched my mom and grandma struggle with it even till date, there are times I see some vein marks all over her head and she will be on in pains, I never knew what I should call it and damn! She was always sick because of me and my younger ones. Maybe it was because she didn’t know that it was anxiety that was disturbing her, the medics she visited didn’t tell her that only normal sicknesses, because she was just too busy to stay around us and we hardly were close. I feel parents especially mothers should not get this tough jobs, they can start with that first, then the whole meditating process will work too, anxiety comes from the mind when the body is stressed so meditation as a parent should be made compulsory. People say we would only understand the struggles of our parents once we become parents ourselves – I totally agree. I think it applies to all aspects of life actually. Unless we get a hands-on or actual experience, we could hardly relate to other people’s situation. Meditation is a good thing to clear the mind because as you’ve said, it’s all in the mind. I guess each of us has a way of coping, except that for some, they would need expert help to get through some situations. Being a parent is never easy no matter how one looks at. Even those that have been into it for years are still finding it difficult to deal with and not have moment to stress and anxiety. This is why I am fully in support of finding a way to bring in distraction when and where it’s necessary to help one ease off anxiety and stress.